While doing the daily crossword a few days ago, I was confronted with a six-letter word starting with “G” for swelling in the neck. I knew the word was GOITER, but I did not know whether it was spelled with an ER or RE. I also realized that I didn’t know too much about goiter, other than the fact that it is somehow linked to the thyroid gland. As I was due for my medical checkup soon, I made a mental note to ask my doctor. Goiter (goitre in UK) is a swelling in the neck caused by an enlarged thyroid gland. The thyroid is a butterfly-shaped gland found at the front of the neck, below the Adam’s apple. Its main job is to secrete thyroid hormones (T3 and T4), which help regulate body metabolism. In addition to the swelling, other signs include a tight feeling in your throat, hoarseness, difficulty swallowing, and, if the swelling is more pronounced, difficulty breathing. 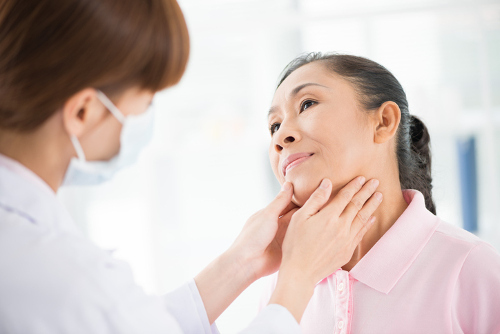 Goiter is more common in women than men, and its incidence increases with age. Graves’ disease: Your thyroid gland produces too much thyroid hormone (hyperthyroidism). Hashimoto’s disease: Your thyroid under performs (hypothyroidism). To make up for the low thyroid hormone levels, your body produces more thyroid-stimulating hormone (TSH), which causes the gland to enlarge. Thyroid cancer: Though thyroid cancer is far less common than benign thyroid nodules, it’s a good idea to rule out malignancy by doing a biopsy. Pregnancy: During pregnancy, an increase in a hormone called human chorionic gonadotropin (HCG) may cause your thyroid gland to enlarge slightly. Inflammation: As with any inflammation, there could be localized swelling of the thyroid. In addition to the above, a family history, certain drugs, and exposure to radiation can increase the risk of goiter. As an enlarged thyroid gland can cause pressure on the food pipe and the wind pipe, it’s best to nip goiters in the bud. The best—and most natural—treatment is to eat a diet rich in iodine: kale, seafood, eggs, turkey, natural yogurt, cow’s milk, navy beans, garlic, watercress, and kelp. If you cannot eat any of these foods, make sure you use iodized salt (but don’t overdo it with the salt). There are some generally healthy foods like cabbage, broccoli, Brussels sprouts, and mustard that are not good for the thyroid. Avoid them if you have a goiter. Remember, some goiters can be caused by excessive iodine, so make sure you consult your doctor before increasing your iodine intake. “Goiter,” PubMed Health; https://www.ncbi.nlm.nih.gov/pubmedhealth/PMHT0024712/, last accessed July 26, 2017. “Goiter – simple,” Medline Plus; https://medlineplus.gov/ency/article/001178.htm, last accessed July 26, 2017. “Graves disease,” Genetics Home Reference; https://ghr.nlm.nih.gov/condition/graves-disease, last accessed July 26, 2017. “Hashimoto’s Disease,” National Institute of Diabetes and Digestive and Kidney Diseases; https://www.niddk.nih.gov/health-information/endocrine-diseases/hashimotos-disease, last accessed July 26, 2017.